Summertime is ending and with it comes the desire to experience every last sunny and warm glorious day. One way to do that as a writer is to travel into the city for a story swap where you stand up and tell a story, without notes, for six or seven minutes. I did this on Saturday in Mt. Airy where a group called Patchwork Storytelling met at the Big Blue Marble Bookstore on Carpenter Lane. Mt. Airy, a Philadelphia neighborhood, is near Germantown where my parents grew up, and so offers memories for this writer … the stone mansions; the big three-story twins like my grandparents’ house on Maplewood Ave. 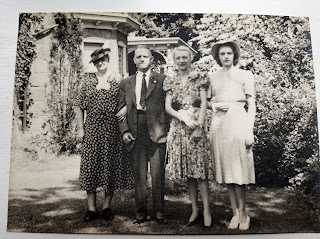 I miss my parents and those days when we drove from our home on the prosperous Main Line to Germantown to pick up my mother’s sister, Edna Gutsche, a woman who never married and in her early twenties would be diagnosed with schizophrenia. Grandmother Weidener’s house across the street from the Gutsche house had long been demolished to make way for a JC Penney, but my aunt lived alone in her parents' house after the death of Grandpop Gutsche; then she had to be moved to a state mental hospital. I especially loved the small brick pathway along the side of the Gutsche's house leading to a backyard garden. Every summer the garden bloomed with fist-sized purple and blue hydrangeas and flutelike pink hollyhocks. It was here a little girl's imagination of romance about someday becoming a writer took flight. It was here in this garden that my parents, Andrew and Gertrude Weidener, married in 1940. So, as we told our stories at the bookstore, I found my mind wandering to those days gone by, although the story I told from memory had appeared in Slants of Light, an anthology the Women’s Writing Circle had published four years before. My short story is about a woman who meets a man for an Internet date and he informs her that he is the Prophet Elijah. I can only imagine how my staid German grandparents might have viewed this as told by their sixty-something widowed granddaughter ... meeting a total stranger for brunch; one who turned out to be a kook … and then retelling it in public. But that’s the writer’s life, isn’t it? We share stories in a rapidly changing world that our ancestors might hardly recognize. After the story “swap” ended, I spoke briefly to a woman named Barbara and mentioned my grandparents. She knew Maplewood Ave. well. She remembered the JC Penney ... and the old Rowell’s Department Store at the corner of Germantown and Chelten Aves., now, apparently, a charter school. 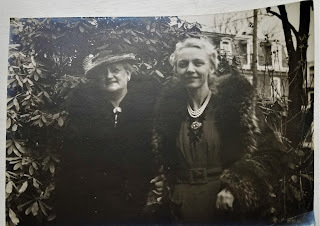 My mother had often shopped at Rowell's as a young woman; it was within walking distance from her house. Faded velvet pink roses she bought at Rowell's and pinned to a summer coat lie tucked in tissue paper in an old box in my upstairs closet. My mother sold her parents’ house in 1979 for $17,500. 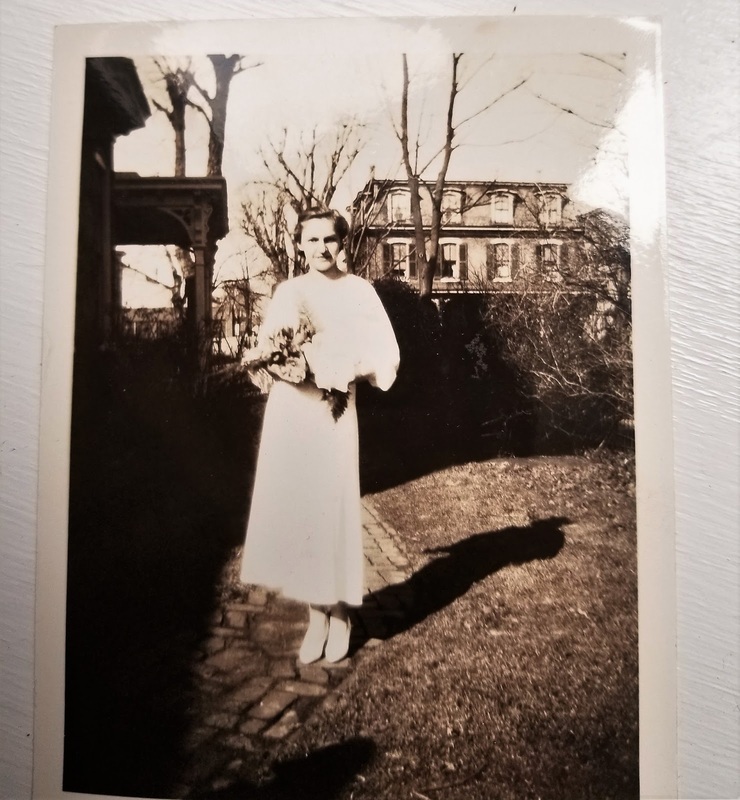 I remember because Mother wailed how it felt like giving it away "for a song" ... her childhood home with hardwood floors and solid cherry windowsills, a house constructed out of gray Pennsylvania stone that glimmered as glints from the mica sparkled in sunlight. But the neighborhood had declined and Mother felt she had little choice. “Oh, that house would now be worth between $200,000 and $300,000,” Barbara said. 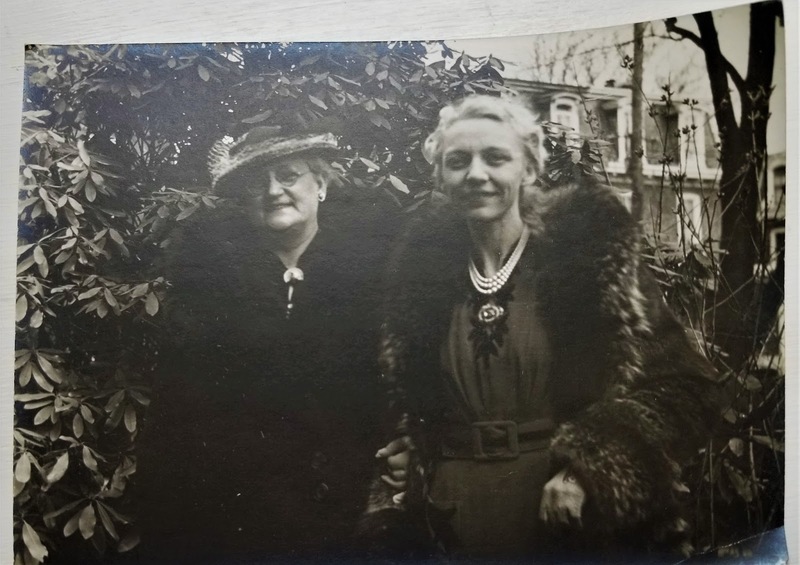 As I pondered that, I felt a sense of happiness, almost relief, that a family appreciated and enjoyed the house my grandfather, a civil engineer with the Pennsylvania railroad, built with great love and attention to detail and quality workmanship. The house lives on long after everyone is gone. My friend Connie and I walked to a nearby café in Mt. Airy for coffee. I felt the vibrancy of a dynamic neighborhood where shop windows displayed signs that read: Hate is not welcome here. There is a sense of renewal and revitalization and new beginnings in these old Philadelphia neighborhoods. Different, new, changing with changing times. Like so many things in life, when we least expect it, we stumble upon the unexpected and from the unexpected arises new thoughts. And from our thoughts and our memories, fresh writing, new stories to share emerge on a beautiful August day.